Zhong Kui: Snow Girl and the Dark Crystal <钟馗伏魔：雪妖魔灵>, a 3D action-packed romance tale about the legendary demon hunter Zhong Kui, will arrive in theaters on February 19, 2015. The film stars Chen Kun (陈坤) as the story’s main anti-hero Zhong Kui, a human blessed with a supernatural ability to hunt and kill demons. He is forcibly caught in a apocalyptic battle between Heaven, Hell, and Earth, which fell on July 15, the day of the fullest moon. 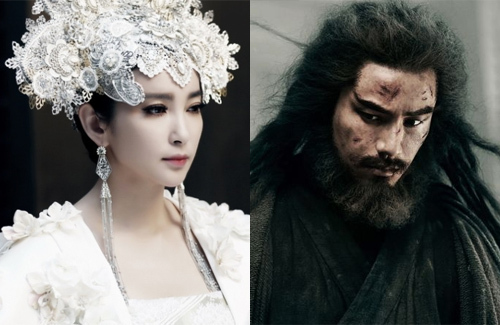 Li Bingbing (李冰冰) stars as the ice demon Xueqing, who falls in love with Zhong Kui despite knowing that human-demon relationships are forbidden. Budgeted at 200 million RMB, the film is co-produced and co-directed by Chinese filmmaker Zhao Tianyu (赵天宇) and Oscar-winning Hong Kong cinematographer Peter Pau (鲍德熹), who is best known for his award-winning work in Crouching Tiger, Hidden Dragon <卧虎藏龙>. The final trailer for the film was released recently, featuring epic battles between humans, gods, and demons. The trailer received many praise for the film’s special effects and large-scale actions scenes. Also starring in the film are Taiwanese actor Winston Chao (赵文瑄), Chinese actress Yang Zishan (杨子姗), Chinese actor Bao Bei’er (包贝尔), and singer Summer (吉克隽逸), who also performs the film’s theme song “Fen Bu Gu Shen” <奋不顾身>. I miss the old style fighting sequences that makes king fu or fighting in general epic, grand and realistic. Like the 90s Jet Li’s Wong Fei Hong series. Where you have dueling between two actual humans. Now aday, all you get is cgi and actors on hanging wires in front of green screen. Even the ones who can fight like Jet Li, Donnie Yip, and the likes are not showcasing it anymore. All big cgi, and i agree it’s a big yawn. If i want cgi, i would play a game where they’re all cgi and great graphic with fake monsters and combats lol. Totally agree. Some cgi effects are good when showing large scale impact perhaps. Those close-ups ‘above waist’ kungfu moves annoys me to no end. OK for tv series and such but not for movies. However, I’m a fan of Chen Kun and I support him. Looking forward to this. Looking forward to this. The teailer is so good. Such a handsome Zhong Kui.